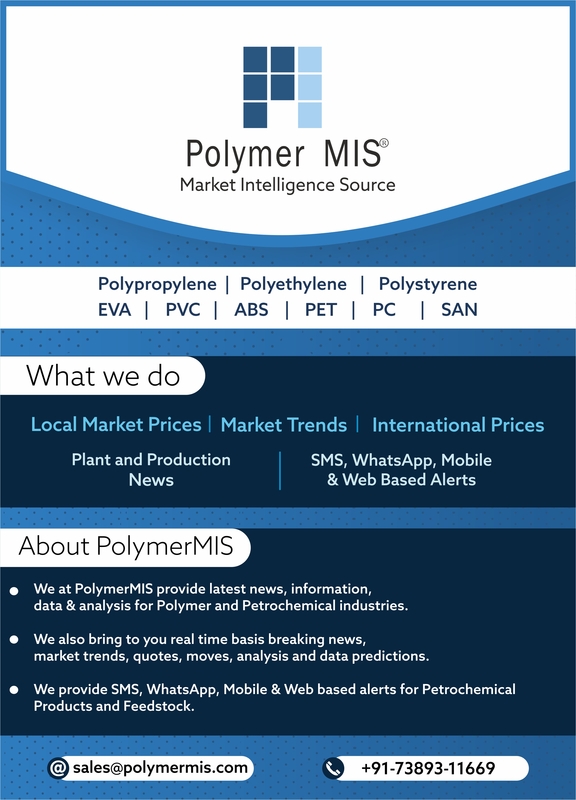 PolymerMIS takes utmost care to provide complete, true, reliable and accurate information from its sources and analysis. However, PolymerMIS is not liable for any errors, omissions, inaccuracies, misinterpretation at user end and incorrect judgment at user end and shall not be responsible for any loss incurring to the user from the usage of information provided on this web site or through the SMS service. 2. Any information on our web site www.polymermis.com can change without any prior notice or alert to the user. User agrees to use any of the information either through SMS or from our website entirely at his/her own risk. PolymerMIS is not liable for delay in transmission of SMS and does not warrant that delivery of SMS will be instantaneous as and when sent from our systems. There can be delays from your service provider or technical issues through the network which PolymerMIS has no control of. PolymerMIS does not warrant that the website will be available uninterrupted or error-free throughout. PolymerMIS reserves the right, in its sole discretion, to select users and to refuse service or subscription to www.polymermis.com to any person or entity for any reason or for no reason whatsoever. Forwarding our SMS or part of our SMS to unauthorized users is a violation and any user found doing same will have his account terminated immediately without any notice and no-refund will be credited back. No content from our website www.polymermis.com may be reproduced, retransmitted, forwarded to unauthorized users or shared in any form possible without prior written authorization from PolymerMIS. Any user found doing same will have his account terminated immediately without any notice and no refund will be credited back. PolymerMIS reserves the right to change or add any fees or charges for access or use of www.polymermis.com at any time which would be effective immediately. Any subscription is non-transferrable and non-refundable in any circumstances. PolymerMIS may terminate account of any user without any prior notice and/or immediately, who misuses www.polymermis.com or fails to comply with any terms or conditions. By subscribing to our services the user agrees to abide by all our terms and conditions mentioned in this document. No user or company or entity or individual who deals in similar business as that of Vista Websoft Pvt. Ltd. or Polymer MIS or is related in any manner similar to our business should subscribe to our services.